The logs produced by activity in your AWS environment are an excellent source of insight for security and compliance initiatives. 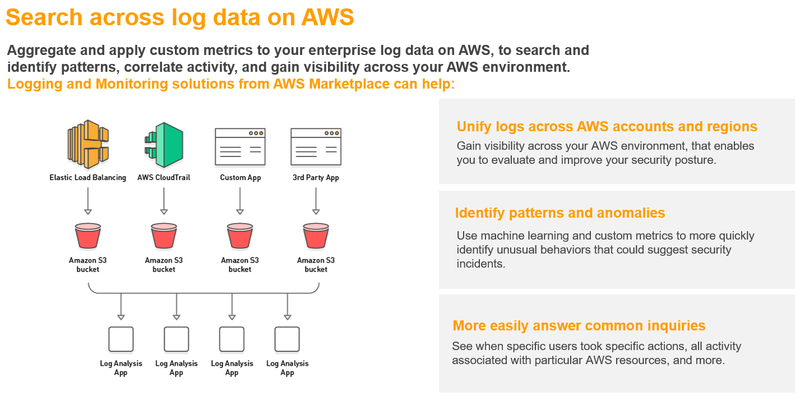 ISV offerings in AWS Marketplace help you extend the functionality of AWS logging and monitoring services so you can aggregate and apply custom metrics to your enterprise log data on AWS, to search and identify patterns, correlate activity, and gain visibility across your AWS environment. Streamline the security of your AWS workloads with Alert Logic Threat Manager with Alert Logic ActiveWatch for AWS - a fully managed cloud-based security and compliance solution delivered as-a-service for AWS environments. THREAT MANAGER combines network intrusion detection (IDS) and vulnerability assessment technologies to enable rapid detection of suspicious activity and identification of threats to your AWS workloads. If you're looking for security and operational visibility across your AWS environment - including applications, infrastructure and AWS services such as CloudTrail, Config, VPC Flow Logs, and more - then Splunk Cloud is the right solution for you. Organizations of all sizes leverage Splunk visibility with AWS agility to rapidly troubleshoot applications, ensure security and compliance, and monitor business-critical services in real-time. Splunk Cloud makes it easy to gain end-to-end visibility across your AWS and hybrid environment. Leverage Splunk Cloud with the free Splunk App for AWS to gain critical security, operational and cost optimization insight into your AWS deployment. Whether you're managing applications, infrastructure or a security operations center in the cloud, Splunk delivers Operational Intelligence for a real-time understanding of what's happening across your business and IT so you can make informed decisions. It's easy to get started - and remember - when choosing a product option, match your location and anticipated index volume per day.